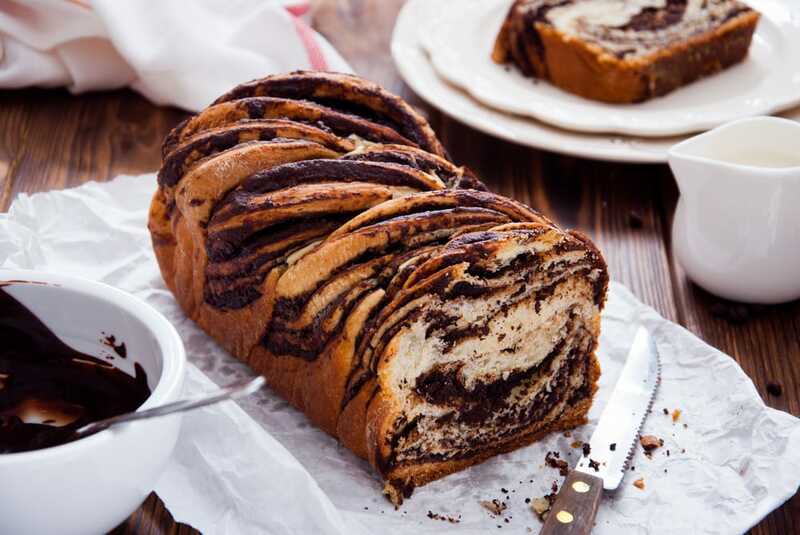 Perfect for serving 18, this chocolate banana babka recipe is perfect for those cold nights craving something warm, moist, and yummy! This egg-free dough recipe is great for rich chocolate lovers. Total cook time is 3.5 hours and fun to bake with the family. 1. In a mixing bowl with a dough hook: Pour flour, yeast, sugar, oil, milk and salt. 2. Knead for 10-12 minutes until dough is smooth. Cover the bowl and let the dough rise for 1-2 hours or until it doubles in volume. 1. Break up dark chocolate into small square and place in bowl. 2. Add butter and melt together in a microwave oven or double boiler until mixture is melted and smooth. 3. Cool the mixture at room temperature until it reaches a spreadable texture. 1. Transfer the dough to a lightly floured work surface and divide into two parts. 2. Roll out each part till 1/2-centimeter (1/4-inch) thick rectangle. Spread half of the filling over each part, evenly spread half the banana cubes, and roll tightly. 3. Cut the roll lengthwise (so the filling can be seen) and form a screw shape from the two parts. 4. Place the cake in a greased pan and repeat with the other half of the dough, the rest of the filing and the banana and second baking pan. 5. Cover the pans and let rise for about an hour or until almost doubled. 7. Brush the risen cakes gently with a beaten egg. 8. Bake for 30-40 minutes or until the cakes are golden and firm to the touch. 9. Cool completely at room temperature. 1. In a small pot, place water and sugar and heat on a high flame until all the sugar is melted and boiling syrup is obtained. 2. Brush the cooled cakes generously with the hot syrup.